Modulo Prosthetics aims to build solid base platforms for personalizable prosthetics through modular design. Prosthetic systems require constant attention, tuning, and modification. Patients currently have to visit all kinds of different experts to accomplish different tasks, such as changing socket sizes or switching limbs types. Training with these prosthetic limbs is also a major issue, for it is time consuming and often requires long training sessions with therapists and physicians. Modulo Prosthetics grants the users a self-reliant platform that allows for easy customization and less reliance on experts to do the things they want to do. The training module, one of the many possible modules to be attached to the base design, allows for patients to train at home by themselves through a system of sensors and audio feedback. We see the training module as an essential add-on to the base socket for self-reliant training is the first step in enabling amputees to be more independent. The training module will help patients improve their gait. 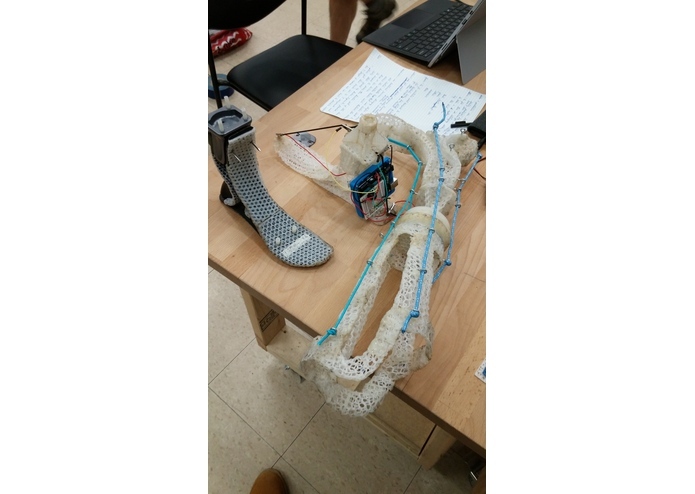 We built it using 3D printed parts and and Arduino to attach a sensor system to a model of a prosthetic foot (under the knee). Improving the training module so as to provide a more multi-dimensional analysis of the gait, continue building cheaper and lighter prosthetic base sockets. I worked on building the training module.